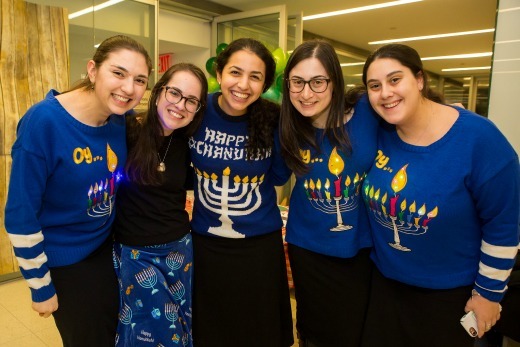 Yeshiva University students and staff are gearing up for this year’s exciting Chanukah programming. A highlight of the fall semester, the holiday brings everyone together in celebration of the ancient Israelites’ victory over the Greeks and the single jug of oil that lasted them for eight days. Singing, dancing and plenty of good food will mark this special occasion as the YU community commemorates Jewish history and the wondrous miracles that occurred so long ago. Celebrate Chanukah with an afternoon of activities for artists, music lovers and history buffs of all ages. For schedule and more information, visit www.yumuseum.org/programs. Join rabbis, mashgichim, roshei yeshiva and friends for a morning of dancing and ruach [spirit] in the Max Stern Athletic Center. Latkes and donuts will be served. Dr. Ari Berman, President of Yeshiva University, will join YU staff to discuss the meaning of Chanukah. Latkes and donuts will be served and dreidel played in Yagoda Commons. Dr. Ari Berman, President of Yeshiva University, will join YU staff to discuss the meaning of Chanukah. Latkes and donuts will be served and dreidel played in Weissberg Commons. Keep up to date with all Yeshiva University events at www.yu.edu/events.